MOSCOW--(BUSINESS WIRE)--Jul. 13, 2018-- Visa (NYSE: V), the Official Payment Services Partner of FIFA, today released an analysis of spending inside the 2018 FIFA World Cup Russia™ stadiums from the opening match on June 14 through the semi-finals on July 11. The data highlights the increased consumer adoption of innovative payment technology, as fifty percent of purchases with Visa in tournament venues utilized contactless transactions, including cards, mobile devices and wearables. The opening match on June 14 -- where fans from 123 countries filled the stadium -- saw the highest volume of payment transactions. The July 1 match between Russia and Spain saw the second highest volume of transactions during the tournament. 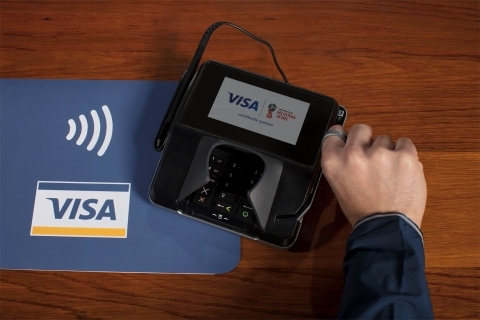 Visa Data: Transactions were analyzed on Visa cards, which were made in 12 stadiums in 11 host cities of the 2018 FIFA World Cup™ for the period from June 14 to July 11, 2018, inclusive.